✉ Subscribe to the Lakedale Blog? Year Round Glamping – in a Yurt! 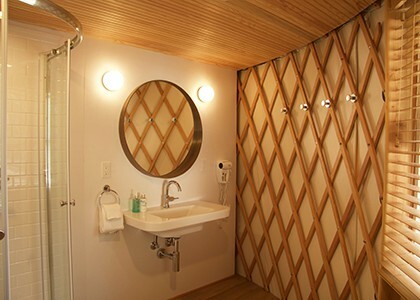 Since our last post on “Yurts – Reinvented”, we’ve opened all seven yurts in our new Yurt Village! With only minutes to spare (yes, really) before our first guests appeared, the bath hardware was installed, construction dust was swept out of nooks and crannies, and hot water was brought up to soaking temperature in the hot tubs on the decks. It was a long birthing process for our septuplets, but we think you’ll agree, they are pretty fantastic! 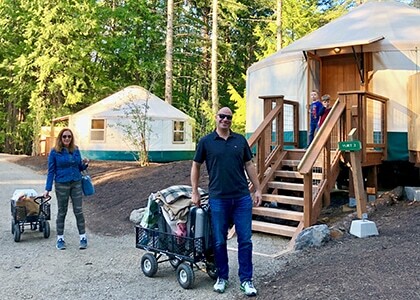 From the moment you arrive at your yurt (we supply wheeled carts to help you transport your luggage), you’ll feel like you’re at home – all the comforts, yet in the heart of nature, surrounded by 100-foot tall fir trees and a wrap-around lake called “Fish Hook”. We wanted to treat you to a fresh look at glamping – no dusty old brown and green color schemes for us! 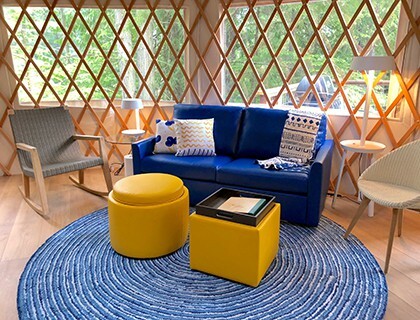 Bright blue and marigold keep the cheerful modern vibe going throughout the yurts (which means “home” in Mongolian). 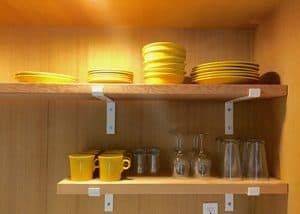 The wet bar is outfitted with a microwave and ample refrigerator, as well as a sink, bright marigold dishes, and pots and pans for cooking on your outdoor BBQ with side burner. The bright blue sofa in the living area converts to the most comfortable queen-size sleeper you’ve ever tried, in fact, you may be fighting the kids to sleep there. Or they may be joining you in the pillow-topped king bed to watch your favorite episode on Netflix – on the 48″ TV. If you need to while away an afternoon, cozy up in the rocking chair with our custom designed blanket, and dig into that summer thriller. Nope, this ain’t your grandpa’s yurt. No heading to the communal bath house in the middle of the night, either…a full bath with curved glass shower doors is yours for your stay, accessed by a smooth-sliding barn door. 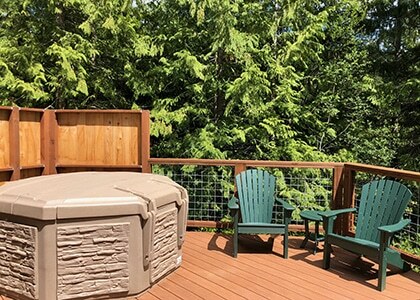 And since we’re all about the outdoors, you can’t beat the giant wrap-around deck with plenty of seating and the hot tub, just for you and your besties. Skinny dipping optional. Lakedale has been evolving for over a decade now. Throughout this evolution, however, one idea has remained virtually unchanged: Taking a break and disconnecting are good! We’ve come to realize that these things can mean completely different things to different people. Whether it’s camping or glamping to get away from the daily grind, getting together with friends and family in a Log Cabin, or spending a romantic weekend in the Lodge with that special someone, we’ve always had a lot of the bases covered. And with the addition of the yurts, we’re excited to offer our guests the option of glamping year-round! Warm and wonderful winter glamping, sounds great to us. So, whether you’re an accountant, a school teacher, a firefighter, or a conquering emperor…we’ve got your vacation plans covered. (Although we may require advanced reservations to accommodate your conquering horde!) Remember that the word “yurt” means “home”? Welcome to Lakedale Resort on San Juan Island, your Yurt away from Yurt!